First time I have attempted to make a Hot Chocolate Lava Cake! It’s got so many names like Dominos Chocolate Lava Cake, Molten Chocolate Lava Cake, Lava Cake etc. I always relished the hot lava cake from Dominos! Not just by taste but by just admiring their hot lava cakes ad on television. Gosh they look so sinful and tempting ;). I always had in the back of my mind to make this delectable dessert called lava cakes. But wondering what stopped me? Thanks to my friend Mahip Hasija because of him I finally tried this :)…… My mom, dad, my sis and jiju all of them liked this yummy Molten Chocolate Lava Cake. One of my friend Mahip had requested to make Dominos Chocolate Lava Cake… So Mahip I am dedicating this recipe to you. Hope you make them and like this lovely dessert. The best part of this cake is the outer crust is dense, crunchy and the inner crust is hot gooey chocolate lava. Quite similar to earth. 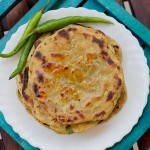 You gotto eat this immediately once baked. So make them when you have to eat them. Next time I will surely try eggless version of chocolate lava cake. I have got a new dish to experiment on. So will surely try something unique with this kind of cake. 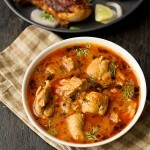 I am quite curious to share this recipe with you guys. So without doing more blah blah lets move to make this! 1. Preheat oven at 180°C five minutes before baking. Grease the ramekins with butter. Dust some flour on it. Sift flour, salt, baking powder and vanilla powder. Keep it aside. 2. Mix expresso coffee in hot water. Whisk it nicely and keep aside. 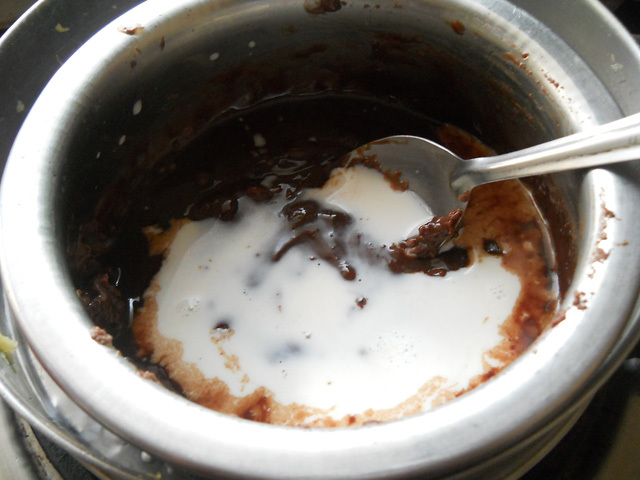 Melt chocolate chunks in a double boiler. Keep stirring continuously. 3. Add milk to it and stir nicely. 4. 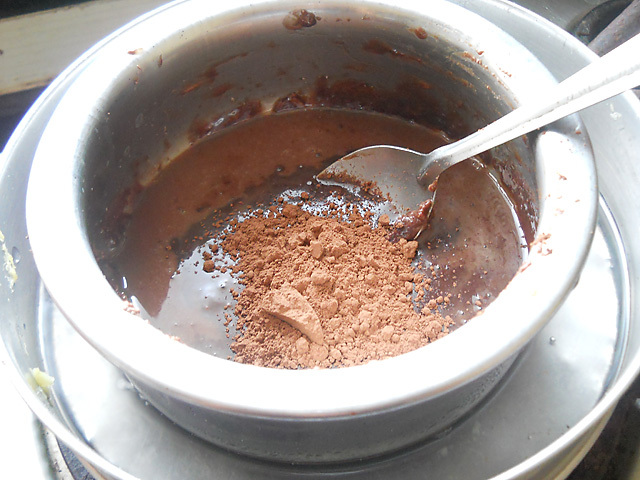 Now add cocoa powder and combine well. 5. Switch off the gas once chocolate melts nicely. 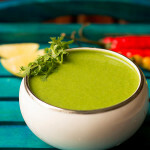 Ensure the mixture is smooth and without any lumps. Allow the mixture to cool down. I don’t have a pic for this one. 6. 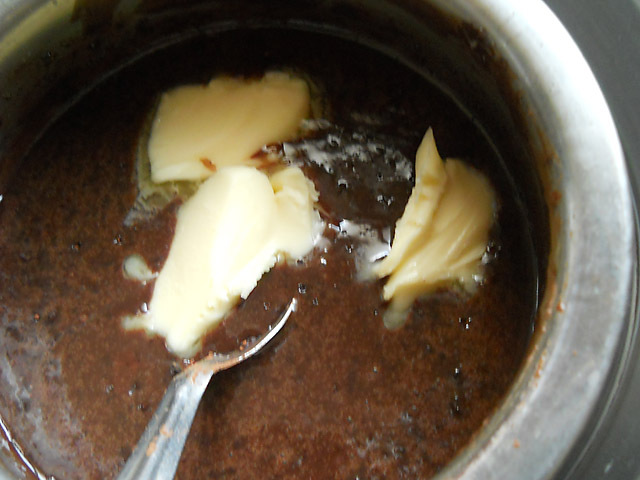 Combine butter with melted chocolate. You could whisk Or use a electric beater to beat. 7. Beat eggs until pale yellow color. Add brown sugar and beat nicely with electric beater. 8. Once the egg-sugar is incorporated nicely. 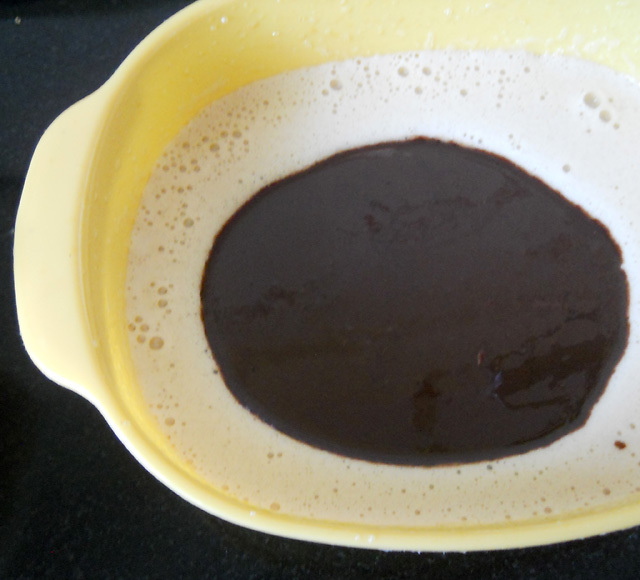 Add melted chocolate-butter mixture to it. 9. It’s time to pour the coffee mixture. 10. Now combine the sieved flour mixture. 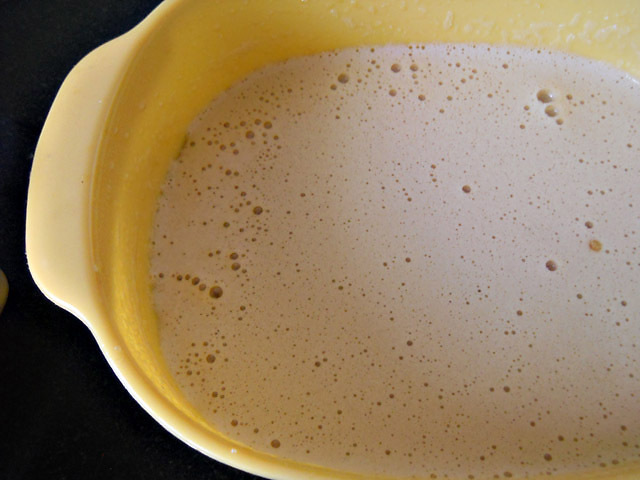 Beat this batter nicely until blends well. Lastly add chocochips and vanilla essence. Allow the batter to rest for 10 mins. 11. Finally pour the batter into greased ramekins. Top with reserved chocochips. Bake at 180°C for exactly ten mins Or once the top and edges of your cake is baked. Don’t bake for long unless you want a soft cake. 12. 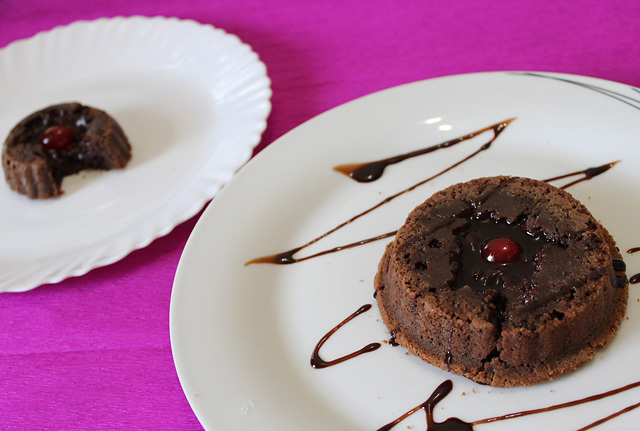 Unmould this cakes after 5 mins Or you won’t get the chocolate lava oozing out. It’s important you serve them hot. Just insert a spoon and the chocolatey will oozee out. Mine tasted too good. Top with vanilla Or chocolate icecream serve hot. 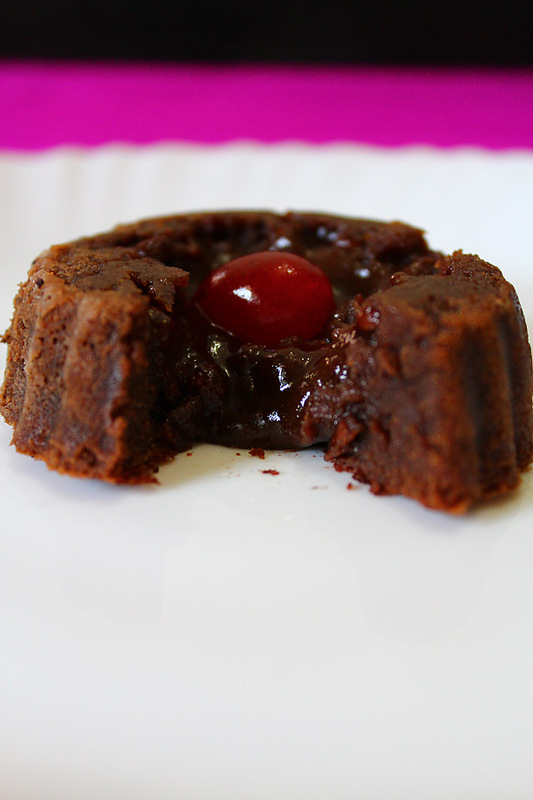 Molten Chocolate Lava Cake recipe with step by step instructions. Preheat oven at 180°C five minutes before baking. Grease the ramekins with butter. Dust some flour on it. 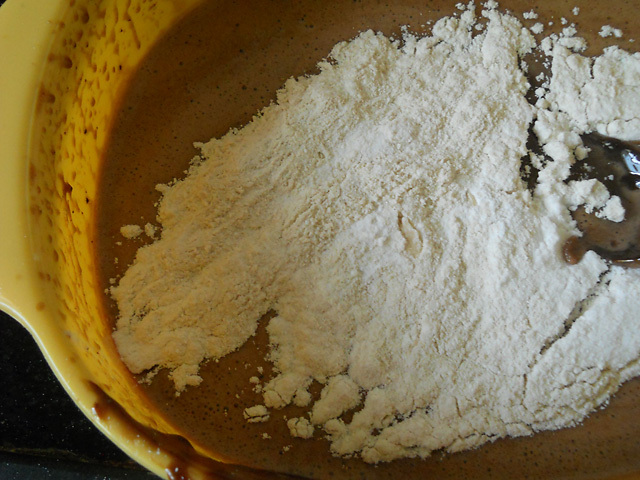 Sift flour, salt, baking powder and vanilla powder. Keep it aside. Mix expresso coffee in hot water. Whisk it nicely and keep aside. 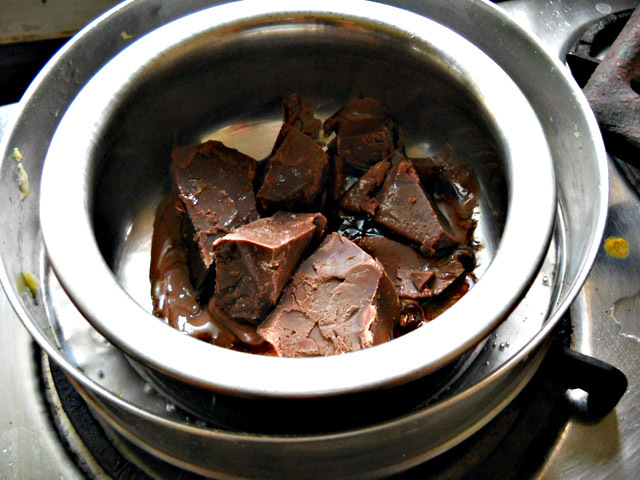 Melt chocolate chunks in a double boiler. Keep stirring continuously. Add milk to it and stir nicely. 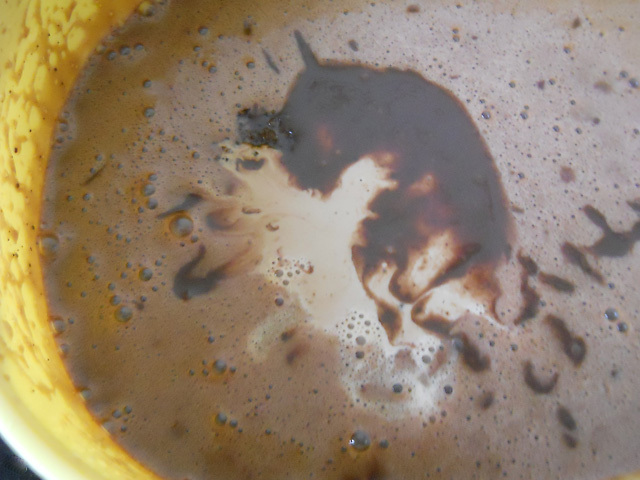 Now add cocoa powder and combine well. Switch off the gas once chocolate melts nicely. 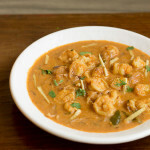 Ensure the mixture is smooth and without any lumps. Allow the mixture to cool down. In the meanwhile combine butter with melted chocolate. You could whisk Or use a electric beater to beat. Beat eggs until pale yellow color. Add brown sugar and beat nicely with electric beater. 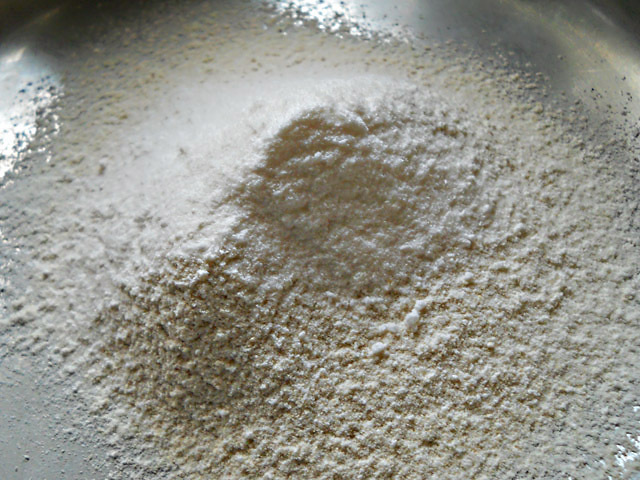 Once the egg-sugar is incorporated nicely. 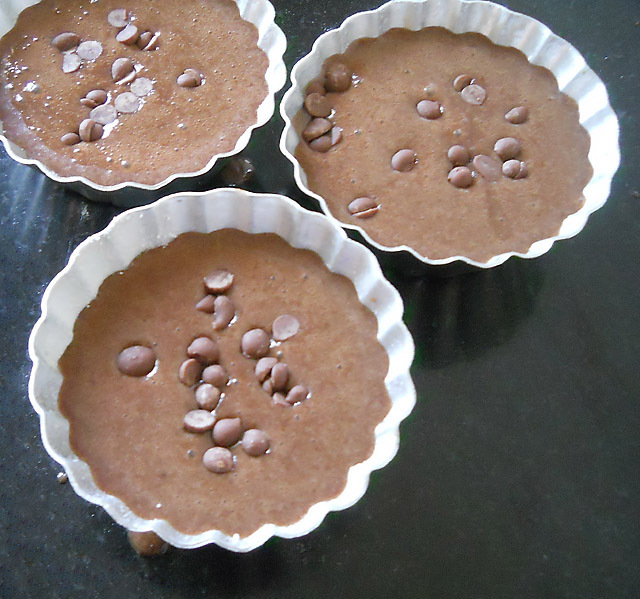 Add melted chocolate-butter mixture to it. It's time to pour the coffee mixture. Now combine the sieved flour mixture. Beat this batter nicely until blends well. Lastly add chocochips and vanilla essence. Allow the batter to rest for 10 mins. Finally pour the batter into greased ramekins. Top with reserved chocochips. Bake at 180°C for exactly ten mins Or once the top and edges of your cake is baked. Don't bake for long unless you want a soft cake. 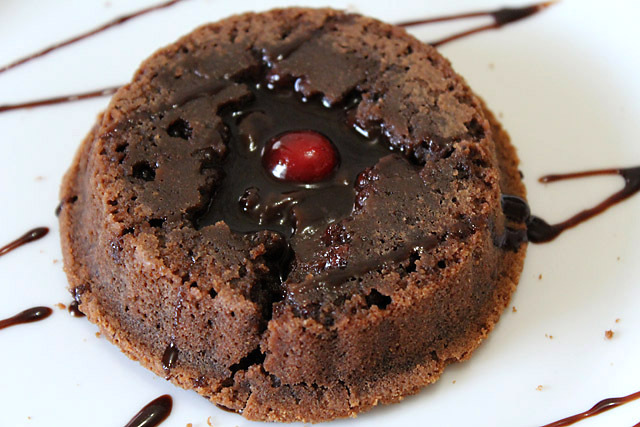 Unmould this cakes after 5 mins Or you won't get the chocolate lava oozing out. It's important you serve them hot. Just insert a spoon and the chocolatey will oozee out. Mine tasted too good. Top with vanilla Or chocolate icecream! HI Maria, What cocoa powder do you use? Nupur I use Hersheys Cocoa brand. Emy sorry for delay in reply as I was out for a vacation. Wish you a happy new year preheating oven depends on which kind of cake you baking. For normal cakes I preheat my oven for 15 mins. Was your cake browning from top and not baked inside???? or it has over-baked??? You are welcome Sunita I am sure it must have become great and yummy 🙂 congrats to you ! Hey Maria, Happy New Year! I haven’t vanished, just went off air for a bit. my laptop crashed, and then I made a quick trip to Mumbai. Got back a few days back and am trying to get organised. My daughter made the choco lava cake and it turned out awesome! She made it for my husband’s birthday, and he loved it. He decided it is much better than the one from Domino’s. 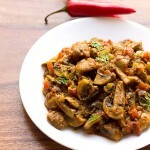 Thanks very much for sharing the recipe! Hey Louise that’s great your hubby loved it 🙂 …. your daughter efforts were fruitful. You are welcome wish you a happy new year. i would like to know eggless version of this cake. please let me know if u have it. 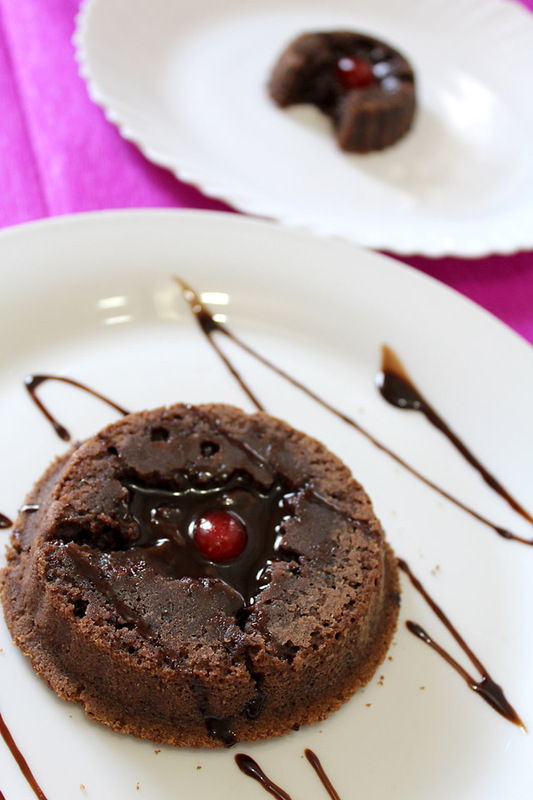 I will soon update you with an eggless version of Molten chocolate lava cake but give me some days as I am out of town. Thanks a ton… You could replace eggs with 50 ml sweetened (condensed milk) Or 1 tbsp flaxseed powder mixed with 3 tbsp water. Enjoy your cake! 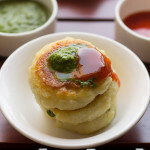 gooey yumness! I’m all for choco lava cakes! Thanks Bakerstreet 🙂 do try them! Sigh, I feel very chocolate deprived now that I have seen this post. The recipe is enough to make me crave this cake, but you supplied this picture which is making my mouth water. Warm chocolate does have a special place on my favorites list which means that this cake is also on that list. Now I need to go find some chocolate. Yum! These look delicious. Thanks for sharing! Thanks a lot Maria… you’re the best…! Will try it AS.A.P.